We are a familty run Animal Sanctuary we are not a "Amusement Farm" or a "Petting Zoo". 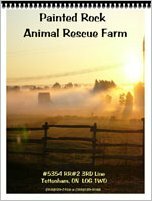 We invite people to tour our farm and visit with the animals as guests coming into our home. We ask that you call ahead to make arrangements as there are a mountain of chores to do. "Call to visit the animals or for a farm tour!"